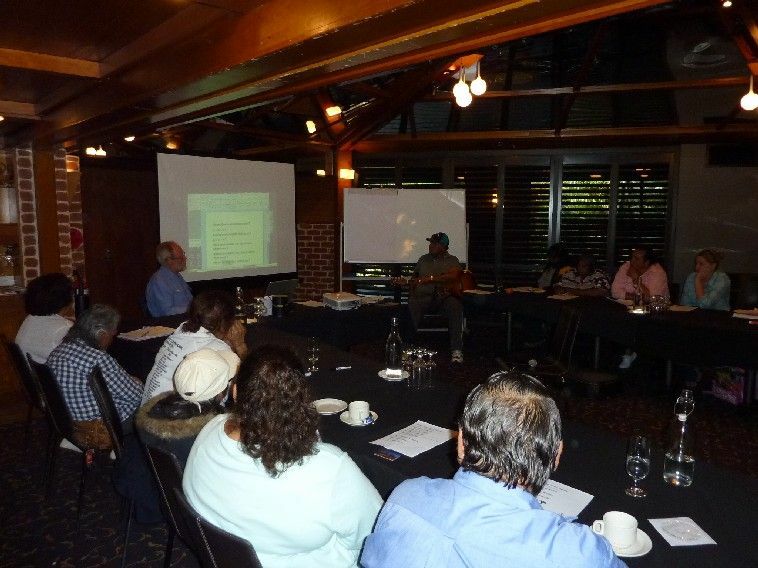 On 2nd and 3rd of February a group of Dieri Aboriginal Corporation members met at the Arkaba Hotel in Adelaide for a Dieri language revitalisation workshop. A total of 30 people attended the two-day workshop, coming from Maree, Lyndhurst, Port Augusta, Whyalla and Broken Hill. The workshop was facilitated by Peter Austin (who flew in from Canberra) and Greg Wilson. Rob Amery and Mary-Anne Gale from Adelaide University came along for one session and talked about language activities being carried out elsewhere in South Australia, especially by the Kaurna and Ngarrindjeri groups, as well as the Cert IV to be offered through TAFE SA called Learning and Teaching an Endangered Aboriginal Language. A number of language focused activities were carried out over the two days, along with a discussion of goals and plans for the Dieri ILS project. We looked at how to write words for parts of the body, and this led to a discussion about spelling for Dieri, as well as how to make new words by combining together words and pieces of words. So ‘mouth’ is marna and ‘tooth’ is marna thandra, ‘eye’ is milki and ‘eyeball’ is milki thandra, ‘knee’ is pantya and ‘kneecap’ is pantya thandra. By itself thandra means ‘fruit’. We talked about some of the grammar in this song, like the ending nhi which means ‘in, at, on’, as in mithanhi ‘in the country’, or nguranhi ‘at the camp’ or warlinhi ‘in the house’. We also saw the ending rni which is used to indicate ‘possession, belonging to’, as in ngayanarni mitha ‘our country’ or yularni ngura ‘your (two’s) camp’ (remember from the last blog post that Dieri has three words for ‘you’ depending on how many people we are talking about). On Sunday Greg borrowed a guitar and we were able to record the whole group singing the new Dieri song, as well as two songs Greg had translated with the Port Augusta mob last year, namely ‘Heads, shoulders, knees and toes’ and ‘Old MacDonald’s farm’. Everyone had a great time joining in with the singing. 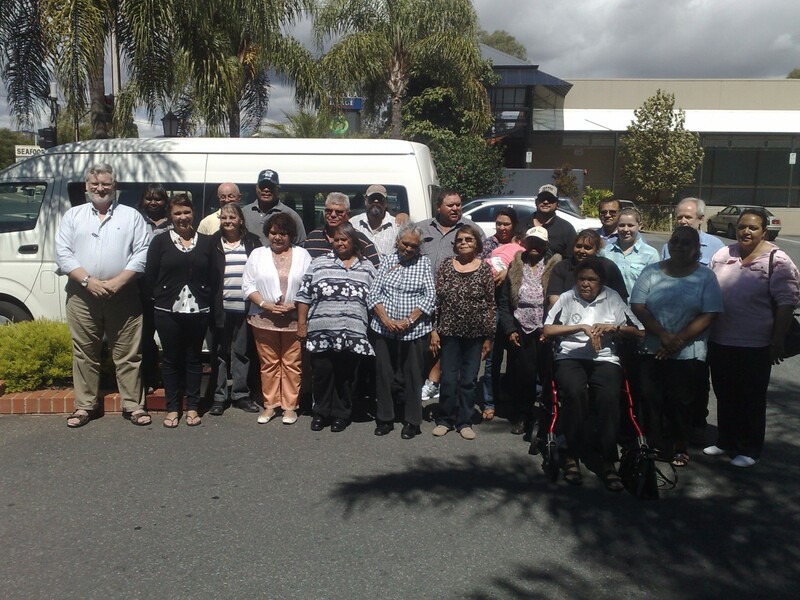 The next language workshop will be in Port Augusta towards the end of March. Note: The title of this blog post means ‘We all talked to each other’ and it is made up of ngayani ‘we all (not including you)’, yathayatharna ‘talk together’, based on the verb yatharna ‘to talk, to speak’, and warayi ‘did’, indicating an action done in the recent past.